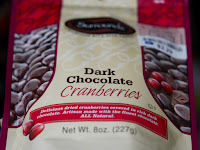 Welcome to the Post-Thanksgiving Day, when many people enjoying left-over turkey, potatoes, green beans and cranberries. 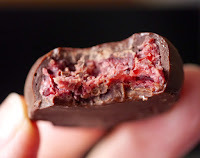 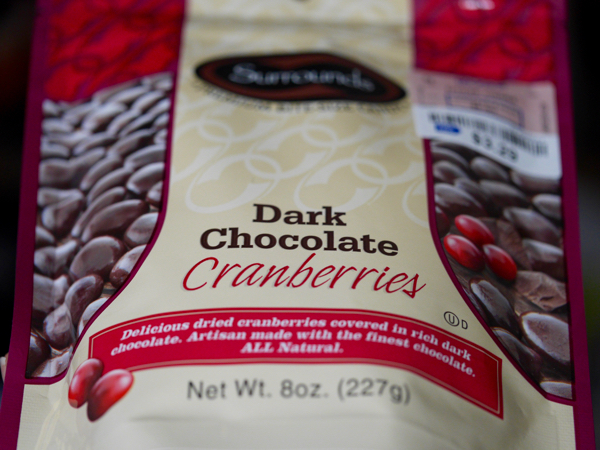 I'm doing the same, only some of the cranberries are covered in dark chocolate. 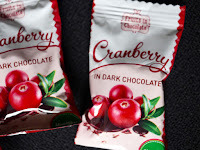 Fruits in Chocolate (made by Chocolate Printing Co.) offer a line of two-bite sized chocolates filled with flavorful dried fruits, that are sealed in convenient, individual serving sized packets. And the company's Cranberry in Dark Chocolate captured the tart-sweet flavor of dried cranberries, just in time for the holiday season. 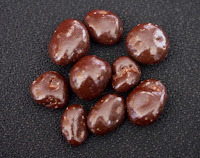 Tomorrow, we'll be exploring blends of chocolate and nuts—almonds and hazelnuts to be exact.